On the basis of the latest observational datasets, the inter-decadal changes of summer rainfall in East China in the past 50 years are analyzed using the Lepage test. The two traditional methods moving t-test and Mann-Kendall test are also performed on the rainfall data as a comparison. Results indicate four inter-decadal abrupt changes of summer rainfall that occurred near 1979, 1983, 1993, and 1999, and each of them is characterized by remarkable regional features. The abrupt change of summer rainfall around 1979 is accompanied by significant rainfall increase in Yangtze–Huai River Valley and a decrease in its flank. The one near 1983 shows similar structures of the rainfall changes to that near 1979, but with more significant changes in the South China and Northeast China (NEC). The inter-decadal change around 1993 brings a notable increase of summer rainfall to the South China; and the abrupt shift near 1999 exhibits significant decrease in summer rainfall over a large part of North China and NEC. 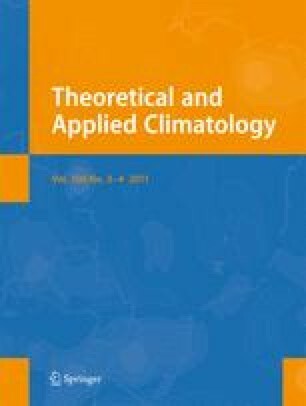 The spatial–temporal features of the inter-decadal changes in summer rainfall are also investigated. Consistent results are observed. Moreover, results indicate that, on the inter-decadal scale, the rainfall variability mode changes from typical tripole to dipole structure since the early 1990s. The authors are grateful to Dr. Jinbao Li and two anonymous reviewers for their insightful comments that led to a significant improvement of the manuscript. This work was supported by the CAS Innovation Key Program (Grant No. KZCX2-YW-BR-14), the National Basic Research Program of China (973 Projects) under Grant Nos. 2010CB95043 and 2009CB421405, and the National Natural Science Foundation of China (Grant Nos. 40890155, 40775051 and U7033002).